We spend 23 days a year staring at our smartphones, according to a recent study. Apparently it’s even worse for kids. That’s a whole lotta swipes, flicks, pinches and taps. But Glued, a new app, wants to help you spend less time on your mobile phone and more with your family by er… using your smartphone. Developed by Nick Kuh, a British developer with his wife Nicole Carman and son Fin, the app is designed to reward users for spending less time on their smartphone. It does this via tracking how much you use the device and shares the information with other members of your family. Essentially, it shames you into putting your phone down. There are also a number of extra features that allow you to manage screen time including specifying tech free periods such as eating dinner, or when children are using their devices to help with homework. “We are a high tech family since I’ve been developing apps for some time. We love our phones and tablets, but we noticed how they were impacting on our family face-to-face time”, explained Nick Kuh. “It’s a bit unfair for parents to ask their kids to avoid using their iPads, iPods, or iPhones, if they themselves are constantly stuck to their devices,” said Carman. 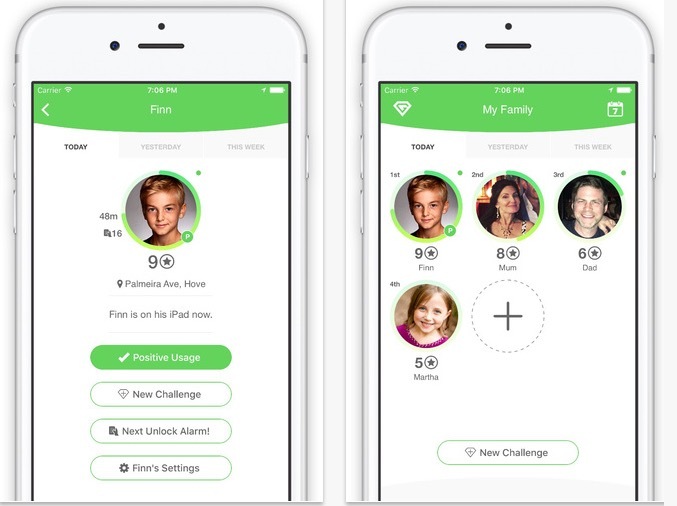 But while most parents think smartphone usage is a terrible thing, the app’s creators believe that there are scenarios where children using their phone can be a positive thing. The app has a “positive use” button that can be activated when important tasks, such as homework requires someone to do a Google search. When turned on, any screen time won’t count against their daily total. I’ll admit, I don’t have kids, but I can imagine trying to convince them to put down a device that is designed to be addictive is easier said than done. So every little helps.